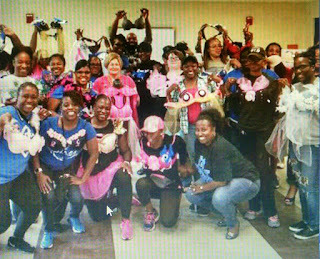 On Saturday, October 14, 2017, Sigma Mu Zeta chapter of Stone Mountain in conjunction with Wade Walker Park Family YMCA of Stone Mountain presented their inaugural “Breast Dressed” event. This Breast Cancer awareness event gathered individuals from the community for a time of crafting bras, education by playing Breast Cancer Jeopardy, intervention, raised awareness and promoted breast health. Donations of head scarves, puzzles and socks were collected to create chemo kit bags for individuals undergoing chemotherapy and were donated to the DeKalb Cancer Treatment Center. On Saturday, October 21st, some of the chapter members wore their bra creations in the Making Strides for Breast Walk which was held at the Braves Sun Trust Park in Atlanta.